Consumer interest in the iPhone 4S is even greater now than it was in the midst of the holiday buying season at the end of 2011, according to a new survey. 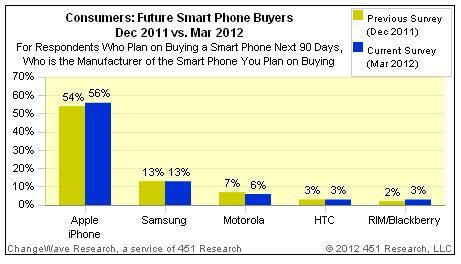 The new data released by ChangeWave on Wednesday, and summarized by Apple 2.0, shows that 56 percent of polled consumers who plan to buy a smartphone in the next 90 days say they will choose the iPhone 4S. That's up from the 54 percent who planned to buy an iPhone 4S in the previous poll conducted in December. While Apple gained ground over the last three months, its chief rival, Samsung, held flat, as 13 percent of consumers said they would pick one of its smartphones. Motorola fell by one point, to 6 percent. In third was HTC, which stayed idle at 3 percent, while Research in Motion's BlackBerry platform managed to grow by a point to 3 percent in the March survey. Demand for the iPhone 4S in March was the second-highest share ever tracked by ChangeWave. Consumer demand for the iPhone was only higher in a poll conducted last September, when buzz about the iPhone 4S just before it was officially announced reached a fever pitch. An earlier survey from ChangeWave published in December found that early adopters of the iPhone 4S were nearly universally happy with their purchase, as 96 percent indicated they were satisfied. That number was even greater than iPhone 4 owners, of which 93 percent indicated they were satisfied after that device launched. The iPhone 4S has been Apple's most successful smartphone yet, leading the company to a record quarter in the holiday of 2011. During that three-months pan, Apple sold 37 million total iPhones, and the high-end iPhone 4S was by far the company's most popular option.